Before I get going on this post, I first have a confession to make: I am constantly making things I pin off of Pinterest. (I adore the idea of a visual bookmark application–trust me, you do not want to see all of my bookmarks still stashed on my browser. Thousands of them with no rhyme or reason. It’s chaos!) So it feels sort of like I’m cheating to be participating in my friend Kitten‘s Pinterest along…. I’m not really stepping outside of my comfort zone if on a regular basis I go to the recipes I’ve Pinned and try them out, right? For this month I think I’ll stick to my usual, but I’d like to maybe try something more daring when it comes to October. With Halloween coming up–Best. Holiday. Ever!–that’s very likely to happen. And another fun bit of trivia : I giggle like crazy at people who talk about, “Pinterest recipes,” as if the recipe actually came from that service. Like Pinterest somehow gives or takes credibility from the recipe used and you know, not the website it was Pinned from. I think there are a lot of people out there who are still confused about how it actually works and do not actively Pin, but merely re-Pin from their feeds. Too funny. Always check the recipe source, people. Anywho. For September, I tried out Gluten-Free Snickerdoodles from Elizabeth Barbone. 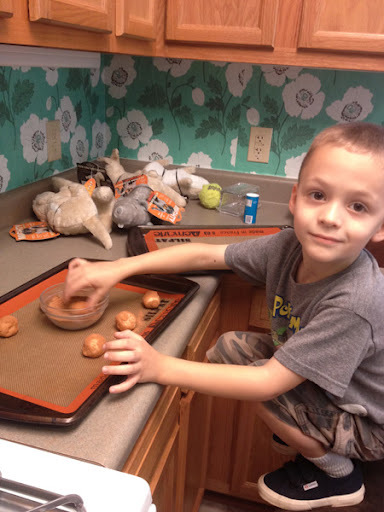 The Boy ADORES Snickerdoodles; they’re his favorite cookie. Other GF people probably recognize her name since she wrote a GF cook book awhile back. (It’s not a bad basic book for starting out. And oh wait, I see she wrote another one this year. That one also looks pretty basic but has some interesting looking things in it none-the-less…ooh! Mozzarella sticks!) As I mentioned before, a very safe Pin since I am familiar with the source and her work. I’m not at all surprised it was a success. I followed the recipe except to substitute unrefined coconut oil for the shortening. You will pretty much never catch me using that stuff. Ever. Oh man. I ❤ Ms. Knitpicky for doing this. Also, for being awesome with the gluten free! I heart Pinterest as well. I tend to make a lot of the stuff I pin and love love love it.